So now I get to frog the hat (rip it! rip it!) and re-knit. 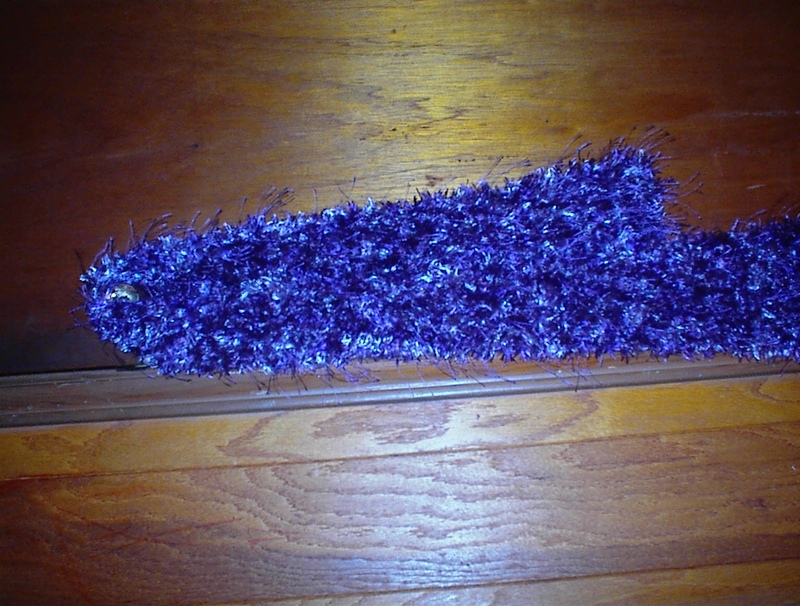 The only question is: since I have to re-knit anyway, should I go ahead and add some Plume FX and make it glitzy, too? Or will I regret it in the morning? 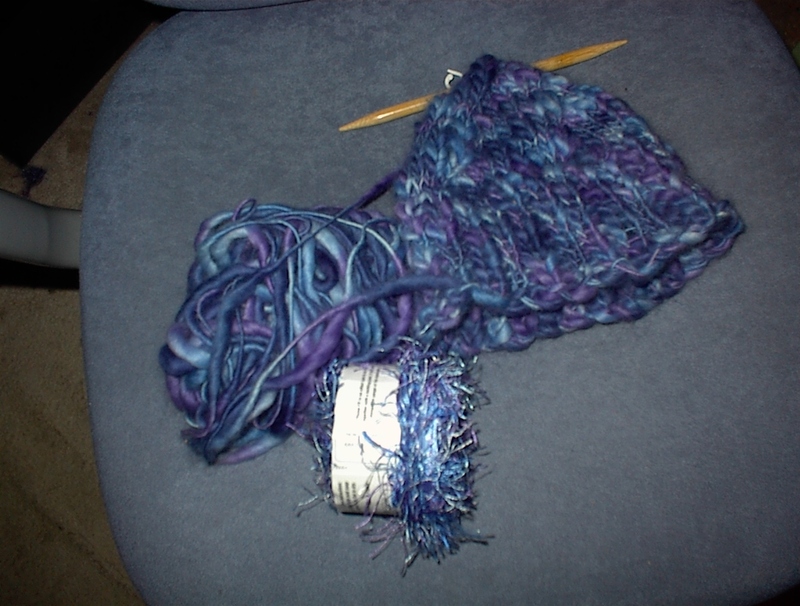 I should mention that I have enough yarn for a matching scarf. Thank you so much for the lovely gift! I appreciate you responding to my traditional offerings of hot chocolate, homemade chocolate chip cookies, and knit goods by producing an amazing quantity of snow. 18 inches was more than I would have dared hope for. Also, let me please apologize for the unkind words that my husband may have had for you when he was tempting his first heart attack by trying to shovel out his car. Sending that SUV sliding sideways across the road in front of our house was all the warning he needed, though, and now he’s on board with the program. I don’t know what others in other parts of the country might have done to tick you off, but rest assured, we here in the Carolinas love you and appreciate all the snow you give us. Thanks again! Just when I begin to think that it’s time to move on to summer stuff comes a reminder that it is February. And so, to those who say I knit a lot, I say, at least the people I love are warm! DR top ten question number Four! Question: How come you’re knitting all these damn scarves instead of working on my damn wedding? Answer: Okay, nobody actually asks me this, but I was worried it seemed that way so I’m answering it anyway. I’m doing both the knitting and the weddings. 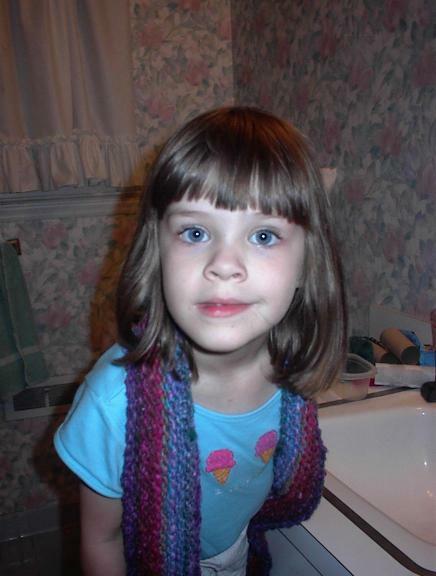 Some of you know this, some of you don’t, but my daughter has PDD. That’s pervasive developmental disorder, also known as an autistic spectrum disorder. In other words, she’s autistic, but not autistic enough to be labeled autistic nor ‘normal’ enough to be labeled ‘normal.’ Smart as a whip, but it’s hard for her to express herself. This means that I spend a lot of time in waiting rooms, like at the speech therapist’s, etc., and I ain’t got a laptop. So I’m working on the knitting a lot during that time. I work on weddings more in the evening, but sometimes I do take a break and chill out. Like tonight, when it’s Enterprise/Angel night. Woot! I’ll probably wander through the computer room during commercials and see who’s IMing me, check my mail, be sure nothing’s totally busted, etc., but sometimes I do need a break. In a nutshell, I’m not ignoring my wedding couples for more frivolous pursuits, but if you’re worried, you’re always welcome to e-mail me. 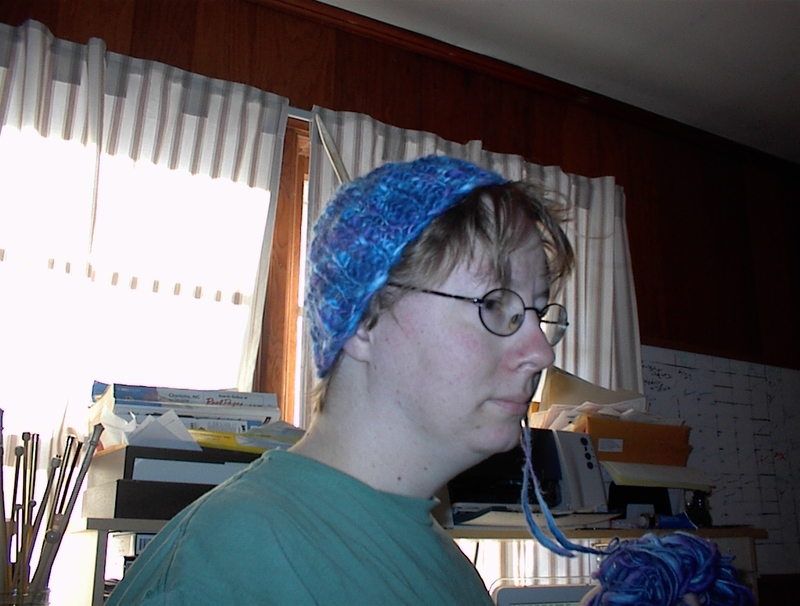 I think this yarn shows the striping better (and for a really good shot of it, you can see one of the worst pictures taken of me) when done in long bands instead of short bits. 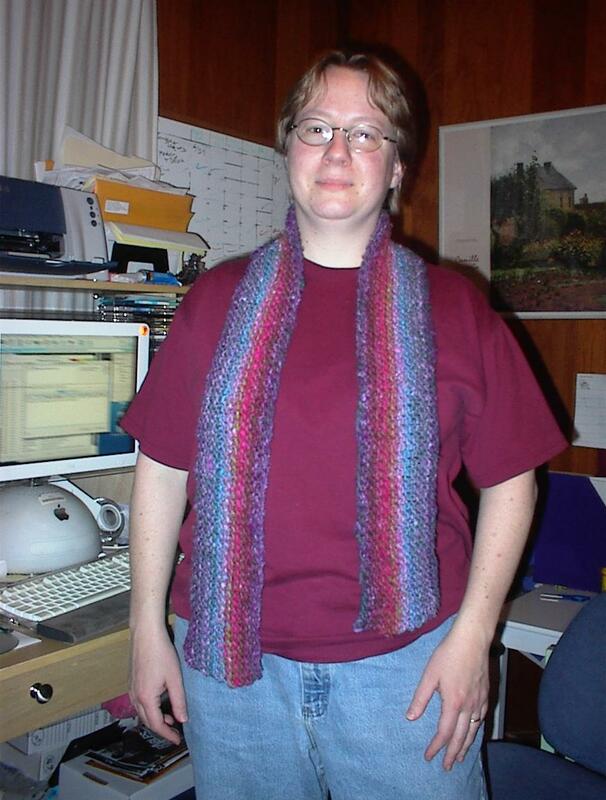 The last one I did in this was knit in a long narrow strip. This one, I did lengthwise, casting on 150 stitches onto #11 needles and then just knitting back and forth until the yarn was gone. 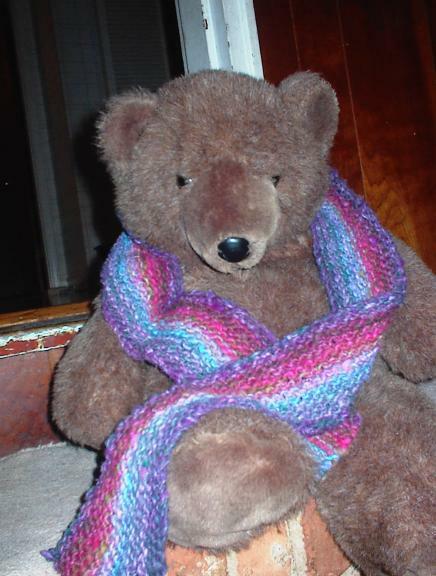 When my daughter saw it, she said “rainbow scarf!” and claimed it as her own. Apparently it doubles as a jump rope. Well, as long as someone’s enjoying it! 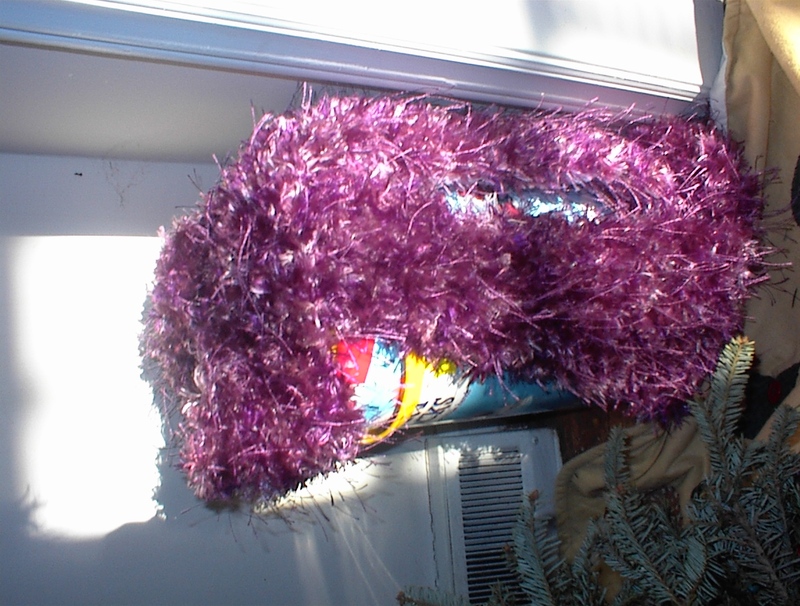 It’s definitely not purple and fuzzy! Here it is, The Manly Hat! I had to go out of town this weekend, so I was able to finish this up since I couldn’t log into DR. The hubby likes it, and it does match his VW convertible. Since he’s paying for so much of this yarn, I was glad to have a project that he could use. Easily the most practical thing I’ve knitted. I do enjoy knitting for others. And now, I go on a yarn diet. No more yarn shops until at least March. This shouldn’t be a problem, since I’ve got so much stacked up. Of course, I do need a few more skeins of the K1C2 Souffle in Razzleberry for the Chickami that I’ll be making after I use up the rest of my stash. Summer’s coming, you know. Okay, I might be an addict. 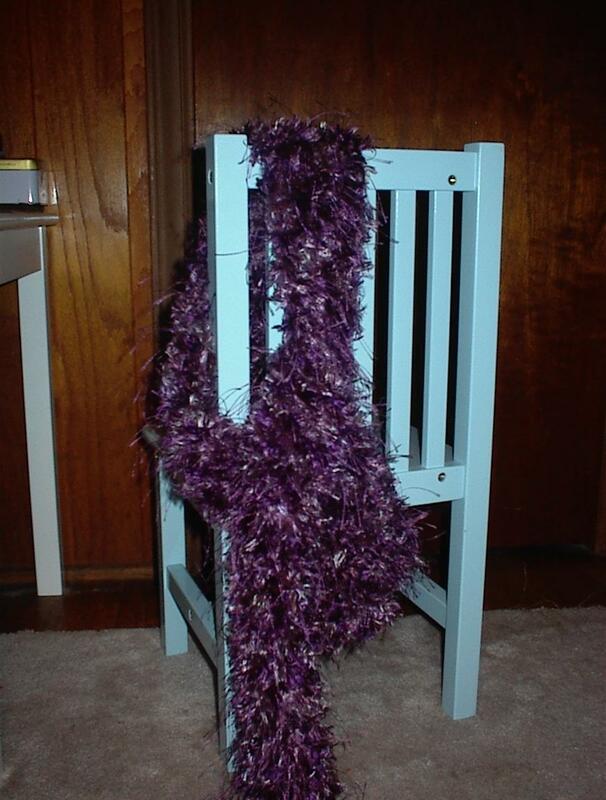 I made another fuzzy purple scarf. Frankly, I can’t be bothered to rotate the picture because it’s almost midnight and I’m also keeping an eye on a wedding reception. You get the idea. It’s purple. And it’s fuzzy. It’s made of one ball of Crystal Palace “Splash” in Orchid and one half of a ball of Plymouth Yarns’ “Colorlash.” It was a super-quick knit on size 15 needles, and since the Splash was in the bargain bin at my local yarn/fabric store, the total price on it was under 15 bucks. I’ve got enough of the Colorlash left to do something else. 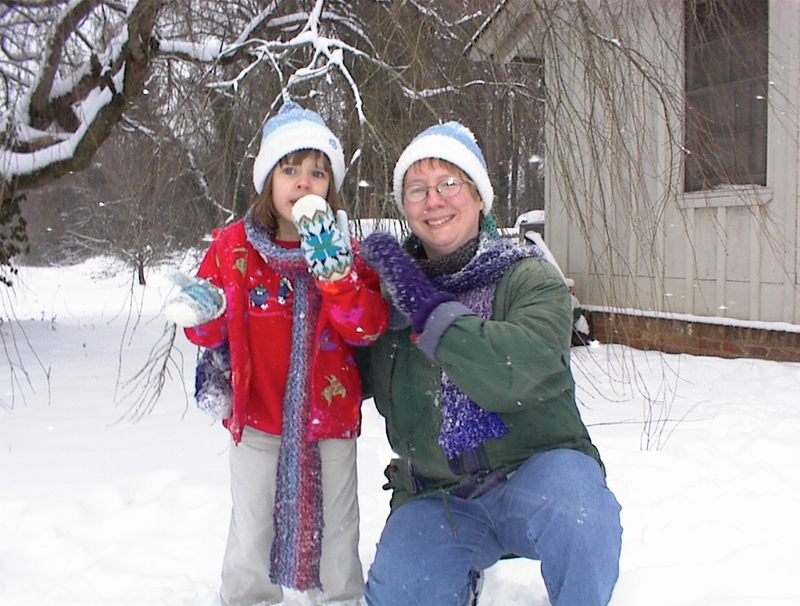 This is also a good lesson in how my digital camera can dramatically screw up the color in something, as witness this picture and this picture of the same scarf. 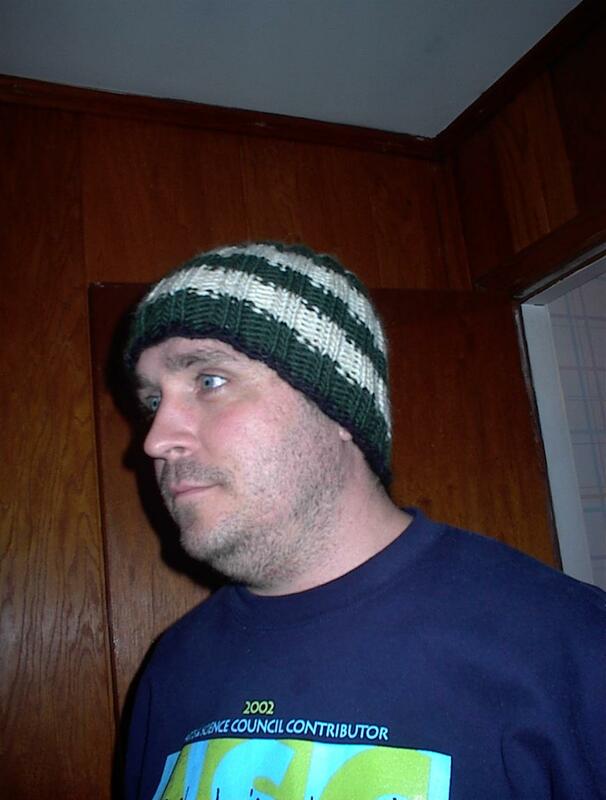 Currently on the needles: The Manly Hat for my husband. Green and tan bulky wool yarn. Nothing fuzzy or shiny about it! When you read the logs of things like Vorclaf’s coronation and see us goofing around like idiots, it’s easy to think that we take all this stuff in stride. But that’s not always the case. When Baron Jeladric died, I think every GM felt a little pang. And while there were one or two jokes cracked afterward, mainly because we can never help ourselves, the overall mood was sad. Some of us got to know him as players. Some of us predate the walking talking Baron. But even the super-old timers know how the players feel about him, and we love our players. I know I have a soft spot for the Therengians, bless their quirky hearts. It’s been moving to hear the GMs talk about what kind of special gift they should bring, or which NPC would be most appropriate to bring out. Even those of us behind the curtain appreciate a world-defining moment. I guess I just want to say that even the powers that be will miss Jeladric. Here’s to ya, Baron. Behold the nupital in its native habitat. [Bartlebee] Advertise it! Elanthia’s First Nupitals! [Dare] That sounds like some sort of small furry mammal. [Reexa] You heard it from the vocab man himself. If he says it, we have a new word in Elanthian vocabulary. [Meriel] Elanthia’s first pre-nuptial agreement. [Vaschon] Kick him in the nupitals. [(Dare)] I am SO not going to admit that was my first thought too. [Tvini] I’m LJing your guttermind, (Dare). [Dare] It’s not THAT dirty. Wait, has (Vaeldriil) been talking? [Dare] Oh, dear god. I was hepped up on cold medicine at the time! I swear! REPORT: Theres some person here being sexually stupid.